It’s a new year and a new beginning for the restaurant at Oak and 41st. 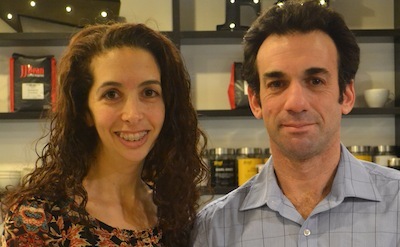 Café Forty One is under new ownership and has reopened at its former location, following the closing of Shuk Eat + Play several months ago. The three entrepreneurs at its helm are energized, excited and ready to feed Jewish Vancouver with soul food that’s kosher, delicious and caters to both the sweet-toothed and those who prefer savoury. About 50 people showed up for the grand opening of Café Forty One last Thursday. Menajem Peretz, by now a well-known face in Vancouver’s kosher catering scene with a well-deserved reputation for culinary excellence, was in the kitchen. The trays that emerged carried crispy avocado spring rolls, bruschetta, and latke sandwiches filled with smoked salmon and sour cream. Peretz’s co-partners, Daniel Presman and Yamila Chikiar, managed the reception, displaying their talent behind the glass display case, which featured an assortment of pastries, mini-cakes, bonbons (Presman’s exquisitely decorated chocolate squares with liquid fillings), cupcakes, strudel, muffins, cake pops and blintzes. “In the two months before we opened, we put up new lighting, re-did the décor and renovated the tables,” said Chikiar, who moved to Vancouver from Buenos Aires 16 months ago with her spouse, Presman, mother-in-law and two children. 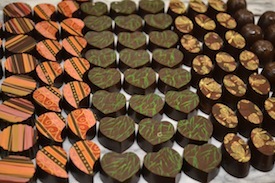 Presman, a chocolatier who sold his bonbons to five-star hotels in Argentina, went back to work making kosher chocolates under the brand name Neshama, and the artistic, rich treats were quickly picked up by Superstore. The couple met Peretz, who is also from Buenos Aires, through a mutual friend and hit it off immediately. Peretz was impressed with the bonbons and asked Presman to supply Neshama chocolates to his catering company. The relationship evolved and Group 41 was the result, a parent company that encompasses FortyOne Catering, Neshama and Café Forty One, and is owned and operated by all three partners. Café Forty One is a dairy establishment following Chalav Yisrael protocols, while FortyOne Catering offers meat, dairy and pareve meals. Chikiar is heading up marketing and communications and managing the front of house for the restaurant, while Presman heads up the sweet department and Peretz masterminds the savoury. The menu includes soups, salads, falafel and hummus plates, shakshuka, blintzes, omelettes, pizzas and sandwiches, as well as a wide assortment of sweet treats. The restaurant is open 10 a.m.-5 p.m. Sunday through Friday and underground parking is free for diners.